There are numerous forms of text ads, which can be used in a variety of ways. For example: you can place a small ad in your newsletter to entice your readers to visit the website, you can use a sponsor ad on your newsletter or e-zine to let your subscribers know that Sandra Carter and "TMJ No More" is sponsoring your newsletter publication by covering costs through affiliate commissions. Sponsor ads should be placed at the top of your letter so that they grab attention. Adding the TMJ No More book into the product section or review section of your website can turn out to be an extremely profitable choice. The most common method used by many of our affiliates is placing a book cover along with a short spicy description or an enticing classified ad. You can also take things to another levels and link that ad and book cover to a review page of the book (that you’ve written or borrowed from my book review section) accompanied by a book cover or a banner at the bottom. You can also use text ads for your pay per click campaigns or place them on your website pages. Make sure to use interesting and curiosity triggering words to grab your readers' attention. 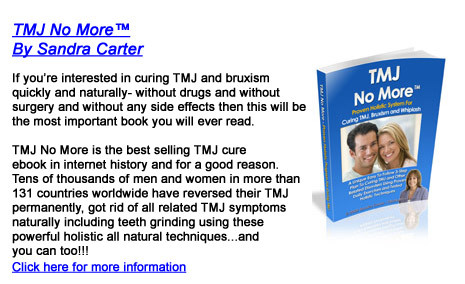 I've provided some sample ads below that can be used on your website, newsletter or anywhere else that you choose to promote the TMJ No More program.
" Sandra Carter- certified nutritionist and former TMJ sufferer teaches you her TMJ freedom step by step success system jam-packed with a valuable information on how to naturally and permanently eliminate your TMJ from the ROOT and achieve LASTING freedom from Bruxism and TMJ related symptoms. "STOP GETTING RIPPED OFF! LEARN THE SHOCKING TRUTH ABOUT TMJ, DRUGS AND SURGERIES... To get the FACTS on exactly how to eliminate your TMJ from the root 100% naturally and Permanently and achieve LASTING freedom from Bruxism related symptoms without spending your hard-earned money on drugs and over the counters..."
"Amazing all-natural TMJ breakthrough permanently eliminates TMJ without drugs or surgery. Stop wasting money on pills, potions, and other worthless quick fix cures… Learn the truth about TMJ once and for all and finally get the TMJ freedom you deserve:"
" New E-book Reveals Unique Holistic Strategies to Cure TMJ. Discover How To Quickly And Easily Cure TMJ Permanently...Even If Everything Else You Tried had Failed...Without Drugs, Without Surgery, and Without Nasty Side Effects – Guaranteed!
" TMJ No More! Cure TMJ , end your Bruxism related symptoms and regain your natural inner balance ... Guaranteed! -- Discover how Sandra Carter has taught thousands of men and women worldwide to achieve TMJ freedom faster than they ever thought possible... Even if you've never succeeded at curing your TMJ before... Right here you've found the TMJ freedom success system you've been looking for! " Note: the image above is a .jpg screenshot of real ad that are in use on live web pages. You can either upload the image to your server and use it as a link on your site or even better: make your own ad in HTML using the text in the ad and a book cover.